Dr. Tonya Gray received her Doctorate of Veterinary Medicine from the University of Illinois Urbana-Champaign in 1998. 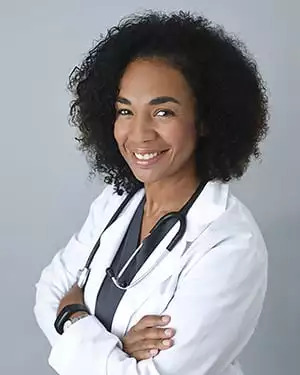 Her areas of interest include dentistry, having completed extensive training from the University of Wisconsin Madison, and emergency surgery. 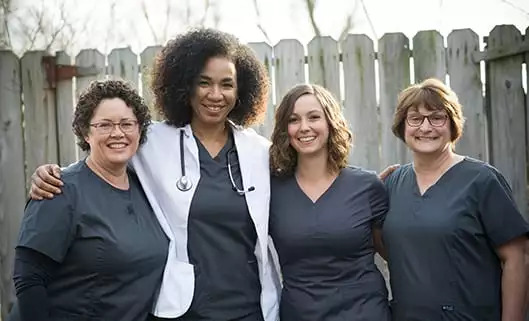 She holds professional memberships with the Chicago Veterinary Medical Association (CVMA), the American Veterinary Medical Association (AVMA), and the Illinois State Veterinary Medical Association (ISVMA). Dr. Gray chose her career path for the love of science and pets. She knew veterinary medicine was the right fit since high school and enjoys nurturing close, longtime bonds with families as they care for pets. Her most rewarding experience in her career is opening Zion’s first animal hospital and offering residents affordable veterinary care that’s also state-of-the-art. Dr. Gray married her husband Rick the same year she started veterinary school. Raising their three sons, Ricky, Derrick, and Benjamin, is her greatest life accomplishment. When she’s not busy helping pets and their families, she’s cooking for hers, watching her sons play sports, weight training, or running – she recently ran her first half-marathon. Vicki received her Bachelor’s degree in Nursing from Marquette University and is a Registered Nurse in the state of Wisconsin. At an early age, she learned about wildlife rehabilitation from her father, and has always enjoyed the company of pets. For Vicki, the most rewarding part about working at Gray Animal Hospital is helping people learn how to care for their fur babies. She and her husband Pete have twin sons, Matthew and Joshua, along with one dog and eight cats (many of whom are very geriatric). In her free time, Vicki enjoys gardening and construction. Her greatest life accomplishment is raising two wonderful boys. Cindy is excited to be at Gray Animal Hospital and she looks forward to working with our team and our patients. What she finds most rewarding about her position is being able to work with so many great people and helping in any way she can—she’s a people person, and she loves helping others. Cindy married her high school sweetheart, Jeff, and they now have three grown children and three grandchildren. She’s extremely proud of them, and could not ask for a better reward in life. Cindy and her husband also have two pets; a Yellow Lab named Phoebe and a male Butterfly Betta named Fin. She loves spending time with her family, along with doing needlework, babysitting her grandkids and watching the Chicago Blackhawks. Carri worked as a veterinary technician for 17 years before joining Gray Animal Hospital. She has always loved animals, having grown up around dogs and horses. She entered the veterinary field after her children started school, and now gets to enjoy helping animals and their owners on a daily basis. Carri and her husband, Randy, have three grown children who are all married, and three grandchildren (so far). Their four-legged family members include Ozzie and Macy, two Airedale Terriers. Carri’s proudest accomplishment is raising three amazing kids. When she’s not at work, she enjoys working in the yard, watching her grandkids, cooking, and singing. Courtney has always enjoyed helping and caring for animals, having grown up with dogs and cats her entire life. It only seemed natural for her to enter the veterinary field and spend five years training to become a veterinary technician. For Courtney, one of the most rewarding parts of being on the Gray Animal Hospital team is being able to help clients and their pets with any medical needs they have. She and her partner share their home with their three dogs, Murphy, Elsa and Toby, and two cats, Kitty and Frank. Courtney’s proudest accomplishment is starting a family with her partner. Outside of work, she loves being outdoors, traveling, watching movies, and spending time with her family. Katie originally worked at a publishing company for 22 years, then spent the next 10 in various office jobs. When she saw a job opening for a veterinary assistant, she jumped at the chance to try something different, and has loved it ever since. She also recently became certified in veterinary dental prophy. For Katie, seeing sick animals recover from their illness and live to an old age is one of the most rewarding aspects of her career. She has three dogs of her own; Schatzi, an English Mastiff; Chico, a Chihuahua/Pomeranian mix; and Hazel, a Pug mix. Katie has been married for 26 years to her husband, a firefighter, who plans to retire soon. They have two beautiful grown daughters. In her spare time, Katie enjoys reading, being with her family, and going to craft fairs. Every since she was a little girl, Angelica has dreamed of having a job where she could help animals. As someone who was always fascinated with the medical aspect of animal care, it seemed fitting for her to seek a career in the veterinary industry! She received her certificate as a veterinary assistant from the College of Lake County to further her career in veterinary medicine. Now, she gets to work with animals every day, and finds that the most rewarding part of her job is helping animals day-in and day-out. At home, she and her spouse have a son, Nicco, as well as a Chihuahua, Sugar, and a freshwater tank filled with 3 fish and shrimp. In her spare time, Angelica enjoys drawing, going to forest preserves with her dog and son, and cooking—particularly her favorite dish, fettucine alfredo! Angelica began as an assistant at an exotic animal hospital and absolutely loved it. So, she continued her education and received her associate’s degree in science for veterinary technician and her CVT license. She loves being able to help animals in her job and some of her greatest achievements involve animals, too, including completing a volunteer program in Costa Rica that dealt with saving Howler Monkeys. Outside of work, she enjoys movies, particularly Eat, Pray, Love and the Secret Life of Walter Mitty. She also enjoys sushi and pizza, but maybe not together! She shares her home with an American Eskimo, Lobo, a Silky Terrier, Brownie, as well as an African Gray Parrot, Echo. Jada obtained her associate’s degree of arts at the College of Lake County and joined our team in July 2018. She has always had a desire to work with animals and it just so happened that Dr. Gray was hiring, so thankfully, she applied and received the position! In her current role, she loves being able to work with so many different animals. Jada also plans on going back to school to become a phlebotomist, because not only does she love helping animals, she enjoys helping people, too. At home, she has three dogs including Bella, a Pomeranian/Chihuahua mix; Max, a Japanese Shih Tzu/King Charles Spaniel mix; and Ace, an Alaskan Malamute/Husky mix. In her spare time, she enjoys working out and hanging out with her family, her boyfriend, Alexio, and her friends. She also enjoys meal-prepping for her workouts. Jocelyn has always been around a lot of animals and loves every minute of it! She pursued her dream to help animals in need by going for her veterinary assistant certificate, and now working with us where she loves getting to interact with all sorts of animals. She is married to her husband, Louie, and they have one daughter, Elizabeth as well as a few furry kids! They have a Cocker Spaniel, Bella, a Texas Heeler, Hercules, an American Eskimo, Zuzu, and a bunny named Charlie. In her spare time, her hobbies include ceramics as well as going to the park with her daughter, and watching her favorite move, Pride and Prejudice.